Mobile applications have become a critical element in the world of many businesses. More businesses are giving their employees mobile devices to use as part of the job or requiring them to use their own devices for work, as well as home. Because of the increased use of these applications, it is critical for companies to make use of mobile application management to ensure applications are handled properly by employees and fully removed from devices that are no longer used by those employees. The whole of Mobile Application Management covers everything, from the development of the app to its complete removal when the company no longer uses it. Enterprise mobility management is actually a combination of mobile application management and mobile device management. Both are essential for businesses that will use mobile applications as part of their regular operations. While some companies are able to handle these aspects themselves, there are others that require the help of an organization to complete the process regularly. What to Look for in a Platform? 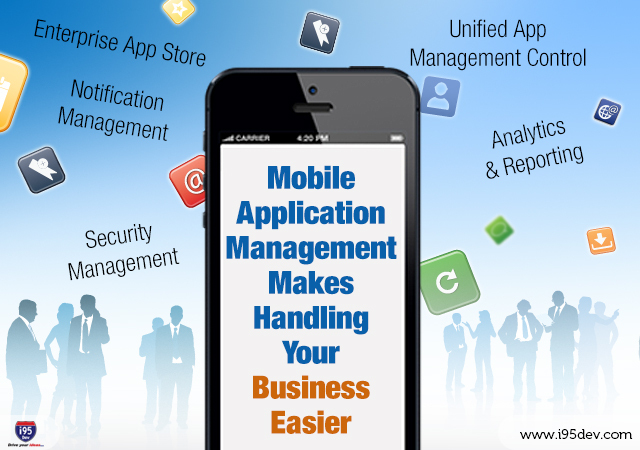 Customized Mobile App Management Platform – Every company has widely varying needs. This is why a customized solution is the best choice, allowing every company to choose exactly what they want in every app. Support Different Mobile Devices and Operating Systems – When employees use their own devices for work, you need to be sure your mobile app management platform works on all mobile devices and operating systems so everyone can use it. The Ability to Generate Reports – Generating reports on the usage of apps by employees is critical to weighing the effectiveness of the apps. The reports can help management identify any security issues or misuse of the apps. An Easy-to-Use Platform – Flexibility is essential in the success of your mobile app management platform. The platform should be easy to use on a variety of devices, be compatible with enterprise policy and create a secure environment. Analyze Employee Engagement with Mobile Devices – Companies should be able to tell if and when employees are using apps on their own mobile devices. Employees should also give feedback on the app to help businesses make changes to improve quality and effectiveness. As you evaluate your need for a Mobile Application Management platform, it is important to consider the features that can benefit your business. Unified App Management Control – Mobile application management updates, tracks and integrates mobile apps through one unified control panel. This central control panel manages the security of the app and monitors its usage. Enterprise App Store – A special enterprise app store is created with the implementation of a mobile application management platform to make apps easier to access for employees. Notification Management – Notifications are sent to IT as soon as employees attempt to access an unauthorized app through the app store. When version upgrades, additions or deletions are available, users will be notified immediately. Security Management – Keeping your business data secure is a top priority. With the use of mobile application management, the platform automatically handles device data protection, authentication, document sharing and more. Analytics & Reporting – Analytics and reporting are a critical aspect of measuring the success of business apps. Mobile application management allows users to extract detailed reports and analyze that data to create a clear overall picture of the success or failure of the apps. When your company relies on mobile devices and apps to do business, it is critical to obtain a mobile application management platform to ensure these apps perform properly. If these apps are used the way they are intended, they can increase efficiency and productivity for your business and employees. Your business will be able to more simply track inventory, sales and more, all from a secure app that can only be accessed by authorized personnel. With all these benefits, adding mobile app management to your business can help you grow much faster.